As the NHL begins towards the stretch drive of a tightly contested regular season, there is something that is starting to stand out. While individual performances from the likes of Evgeni Malkin, Steven Stamkos and Henrik Lundqvist are bound to create the most buzz, the 2011-2012 season has quickly become the year of the head coach. Numerous NHL head coaches have already earned the right to at the very least be considered candidates for the Jack Adams Trophy, and although only three men can be nominated, that shouldn’t prevent a handful of others from getting the recognition they deserve. *With too many coaches to include at once, I will start with the candidates from the Western Conference and conclude tomorrow with the East. 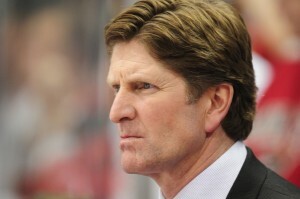 As long as he is the head coach of the Red Wings, Babcock’s name might as well just be penciled in on the ballott. The 48-year-old once again has the Red Wings in contention for both top spot in the Western Conference and also the Presidents Trophy as the NHL’s regular season champions. Not considered to be one of Detroit’s most talented rosters in recent years, Babcock has gotten his players to (as usual) buy into and perfectly carry out his systems. It seems that no matter who is plugged into the lineup, the club never misses a beat and that is a direct component of their coach. Barry Trotz, Nashville Predators: Much like Babcock, Barry Trotz has become no stranger to being nominated for the award. The only head coach that the Nashville franchise has ever known, Trotz has done a remarkable job of helping turn the Predators into legitimate Stanley Cup contenders. This year’s team might very well be the best that Trotz has had in his 12 seasons behind the bench, and after winning their first ever playoff series a year ago, the Predators could very well have more in store this year. Dave Tippett, Phoenix Coyotes: For the third straight year, Dave Tippett is proving himself to be one of the game’s best coaches as he has once again taken his unheralded Coyotes to unexpected heights. Currently first place in the Pacific division, Tippett has implemented his defense-first system to a T.
The brilliance of the 50-year-old’s tactics are proven no more than the discrepancy in performance between the club’s most recent goaltenders. Current goaltender Mike Smith was never really considered to be a true starting goaltender in his time with the Tampa Bay Lightning, but in his first season with Phoenix, Smith is posting numbers that rank with some of the best goalies in the league. On the other hand, the same Ilya Bryzgalov who had himself become of the best netminders in the league, has had an awful go of it with his new team in Philadelphia; looking nowhere near the player he was in Phoenix. Ken Hitchcock, St. Louis Blues: The likely front-runner for coach of the year honours, Hitchcock has guided the Blues to one of the most incredible season turnarounds in quite some time. After Davis Payne was fired one month into the season, Hitchcock took over behind the bench and ever since the Blues have won, won and won some more. Tied with Detroit for the Central division lead and one point back of the Vancouver Canucks for first overall in the NHL, the Blues play under Hitchcock has been something quite remarkable to watch. One of the hardest teams to score against in the league, the Blues are playing near flawless hockey under a coach whom they didn’ t even know until he took over in November. 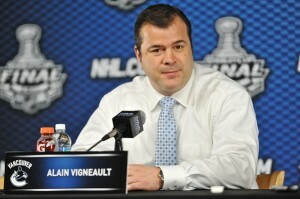 Alain Vigneault, Vancouver Canucks: As the head coach of the defending President’s Trophy winner and Western Conference champion, Vigneault’s efforts are flying a bit under the radar. While you cannot give all the credit to the coach, Vancouver’s continued success shouldn’t diminish what Vigneault is doing as the team’s driving force behind the bench. Currently the top dogs in the NHL standings, Vancouver is hoping to return to the same heights they climbed a year ago. As we all know, the club came one step short of reaching the peak of the mountain, and Vigneault has done an excellent job in making sure that the hunger to get back remains in his players.